Both client-side and server-side tracking and delivery solutions have their advantages – here’s your guide to knowing the differences between the two, when it’s critical to test both options and how to strategically pick what’s best for your organization. Client-side Tracking – Client-side delivery of data is commonly accomplished through tags – one of the most popular ways to transmit data from web pages. This type of tracking involves having the user’s browser (client) directly send data to a server. This method is used for collecting and sharing data from your website to your marketing technology vendors and is referred to as tag management. Server-side Tracking (aka, Cloud Delivery) – Server-side data management, also known as cloud delivery, is when a pixel or tag sends data into your web server (or a different type of server), then your web server passes that data to the destination system/server. This data can then be used by a marketing automation platform, analytics provider, personalization tool or any other type of execution system. Client-side and server-side are the two ways an organization can collect and deliver data, but each approach comes with its own respective set of both benefits and drawbacks. In order to have the most comprehensive, secure, and flexible data supply chain, Tealium recommends employing both client-side and server-side collection and delivery based on your strategic data needs. When there are circumstances that don’t necessarily make the decision clear it’s critical to have a system in place that allows for testing of both options to determine the best solution for your organization. By determining which of the below initiatives your brand should be employing you will be able to better decide which option is best for you – client-side, server-side or both. Client-side tracking is typically less expensive and is also more common, leading to more available resources with this expertise. Server-side tracking oftentimes can be very complex and require high technical expertise. Conversion tags and ad pixels have a long legacy of using client-side tracking. This type of data exclusively comes from the browser, which can only be accessed client-side without taking extraordinary measures. Client-side data management typically leads to a better capability for modifying in-browser interactivity. URL parameters are much easier accessed client-side since this data occurs in the browser. To get this data server-side would require extraordinary measures. Heat mapping is a way for a brand to understand what their website visitors are thinking and wanting based on the actions they’re taking on the site. Heat maps show different colors (red, orange, yellow, green and blue), to convey and highlight the intensities behind a users eye movements, interactions and behaviors. When data is not coming from your own site or application, server-side tracking can be more robust than trying to deploy client-side tracking in a 3rd party system. While server-side tracking will commonly incur greater cost, it also commonly improves application performance and speed. Server-side tracking leads to less code “bloat” by off-loading processing from the user’s device to servers in the cloud. While we don’t advocate trying to advertise to users who are attempting to block ads, ad blockers can block data not related to ads in certain scenarios. Ad blockers can only block client-side tracking. If a high percentage of your users are likely to use ad blockers and those ad blockers block the transmission of certain data, your customer experience strategies may not ultimately reach your targeted end user. Highly sensitive data is best kept away from unpredictable or uncontrollable environments, like a user’s browser. Ad blockers are plugins or browser extensions on a website that remove or block an advertisers content altogether. They work by having the ad blocker look at a websites scripts while it’s loading and then compare it against a pre-determined list of websites and scripts it was built to block. Getting data into a unified customer profile and understanding how that data is interpreted in the record is a complex consideration. In this scenario, it’s critical to have both options and test in order to confirm the data is appearing in a desirable way. Sometimes, you may not be attempting to create the absolute best customer experience, but rather the best compromise of customer experience and cost. Server-side tracking will typically incur greater costs. In these scenarios, it’s best to test how much customer experience suffers based on certain setups that will save money in order to achieve an optimal balance. Certain systems work with user-level data, while others work with event-level. Data like a pageview is event-level, while ‘time on page’ is user-level and requires some processing. Depending on the context, user-level data might require server-side processing, sometimes not. If you’re working with both types of data, you’ll want the flexibility to test both tracking options as it relates to your ability and flexibility to combine user-level and event-level data to produce a corresponding vendor action. Native mobile and the mobile web have drastically different data types and tracking methodologies. If you are trying to use data from both, you’ll most likely want to test both client-side and server-side tracking to determine which gives you the data you need. Native mobile refers to native apps, and they are very popular. They deliver the best user experience, are great at solving complicated tasks and are considered to be the most reliable of the app types, compared to hybrid and web. There are now over 6600 marketing technology vendors, only a small number of them offer server side capabilities. That is why it is key for organizations building a best-of-breed marketing cloud to have flexible options for data collection and delivery. Not every situation warrants, or is capable of, server-side (cloud delivery) for data collection and delivery as most martech vendors, today, don’t offer server-side options. Oftentimes, traditional client-side tags are the optimal solution and it’s critical to have flexible capabilities accommodating both traditional and emerging data management practices within the same platform. It is essential that the vendors you work with are true partners in your relationship and will help determine which scenarios are best served by either method. 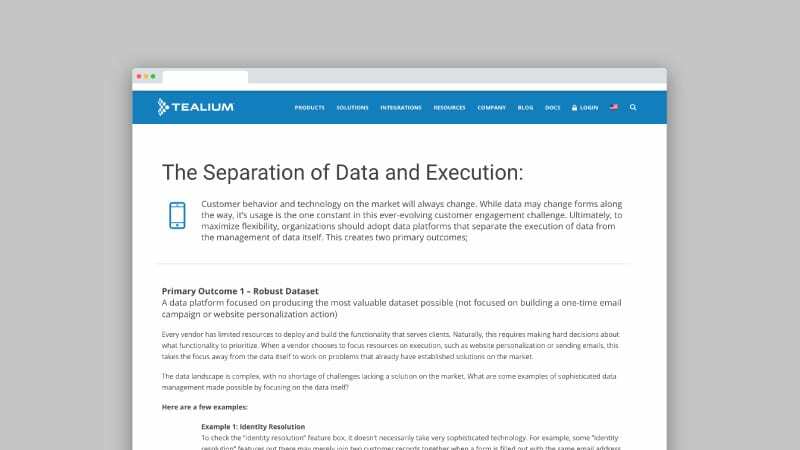 Tealium partners with customers to help evaluate your current data strategy and business needs, and determine how to optimize performance and get the most ROI from your spend. Tealium offers customers both client-side and server-side options, so brands have the power to make the right choice for your data strategy, business needs, and budget. Tealium’s Universal Data Hub gives customers the greatest array of functionality on the market to manage the enterprise data supply chain in a comprehensive, flexible and vendor-neutral way with over 1000 client-side and server-side integrations. By leveraging the Tealium Universal Data Hub, organizations can build a portable data foundation using their data to power a continually evolving, best-of-breed tech stack.